Want More Butterflies? Grow Caterpillars. We love butterflies. They’re the rock stars of the garden, and we’re the adoring groupies. We plant flowers they like in hopes of a glimpse of wing. And we realize that to have butterflies we have to have caterpillars. But watching our dill mowed to the ground by a big green insect chewing with its mouth open channels our inner Mr. Hyde. Murder rises in our hearts, and we don’t care that this meaty, crawling thing will one day be a swallowtail. We just want it gone. What I hear is: “How do I get rid of butterflies?” See where this is going? Caterpillars + eating your (fill-in-the-blank) = butterflies. A caterpillar is little more than a mouth attached to an intestine. It’s a competitive eating machine, with the prize a pair of wings. Eat, molt, repeat, eat, molt, repeat. Once at fighting weight, the caterpillar molts itself a chrysalis, and in a week, a month, or a year – ta da! – emerges as a beauty queen. Humans are fickle. Butterflies, yes. Caterpillars, not so much. We squish and spray. Then we plant butterfly gardens and wonder where the butterflies are. Even if we’re not killing caterpillars, we give them short shrift. Too often we focus on the pretty nectar plants, and overlook host plants. These are the plants butterflies lay their eggs on, and caterpillars eat. Some, like monarchs, have evolved to feed from only one kind of host plant, and nowadays that gets a species in trouble. So plant milkweed to bolster the fast-dwindling monarch population. But Lepidoptera in general need much more help in the host plant department. Fortunately, there’s a group of plants that support a multitude of butterfly and moth species, and you may already have a few in your yard. Trees. 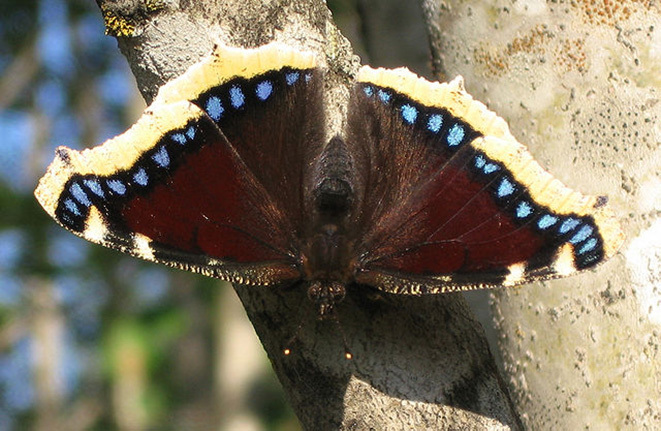 In fact, some trees nurture more species of butterflies than all the plants in a traditional butterfly garden combined. That’s because, like kids, caterpillars have to eat their greens to grow healthy and strong. (Not all caterpillars eat leaves, but most do.) 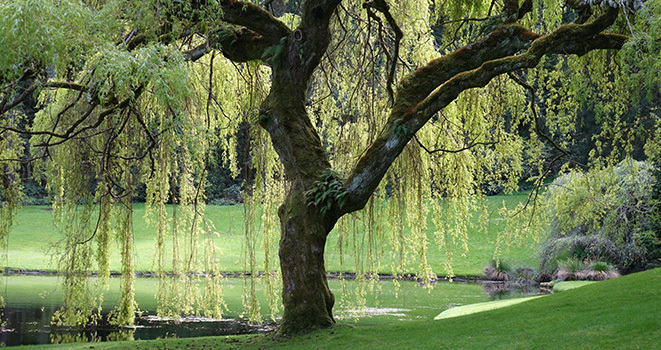 As plants go, trees majored in leaves, and – defoliating armies like gypsy moths excepted – have chlorophyll to spare. In developments where the trees have been removed, or there’s only a showy specimen tree or two plunked in the middle of a lawn, a butterfly garden is a bit like a sumptuous buffet in the middle of a desert. A female butterfly that’s heard last call at the nectar bar can’t then find a suitable place to lay her eggs, as gardeners we have unintentionally performed a bait-and-switch. So in addition to the bennies that trees already provide, such as oxygen, add butterfly incubators to the mix. Take a look at the number of butterfly and moth species who depend on a particular genus of tree for caterpillar food. Here are the top 10*, taken from Professor Douglas Tallamy’s website. He wrote the book Bringing Nature Home (Timber Press). So if you’re thinking of planting a tree this fall, I ask you to consider one that, in addition to the reason you’re planting it, also acts as a haven for the widest variety of caterpillars species. An oak or two would be a good idea. And if you haven’t thought of planting a tree for caterpillars, consider it. Once you’ve added trees, go ahead and plant those butterfly flowers. Then wait for the wings. They’ll come. 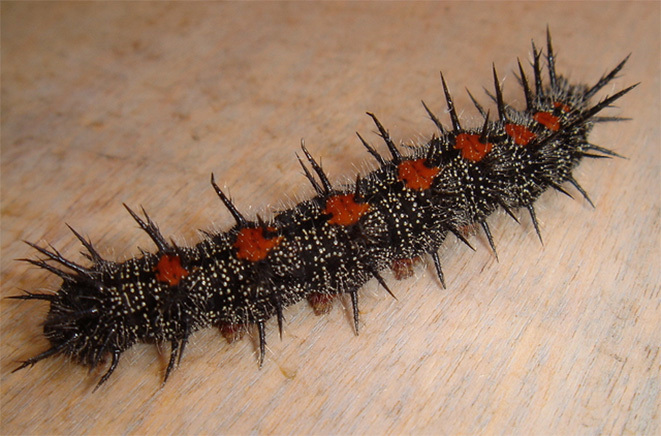 "Nymphalis-antiopa-caterpillar" by Wthrower at English Wikipedia - Transferred from en.wikipedia to Commons. Licensed under Public Domain via Wikimedia Commons. "Nymphalis antiopa (Suruvaippa)" by Kymi - Own work. Licensed under CC BY-SA 3.0 via Wikimedia Commons.